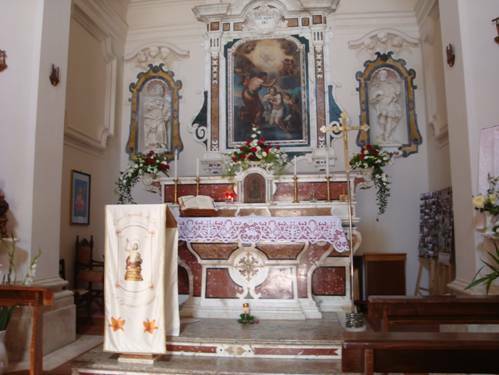 One of the first blogs that I wrote (see post from Oct 30, 2010) about was the town that my great, great grandmother Filomena Ursitti was born in on May 8, 1837; the town of Opi, Italy. 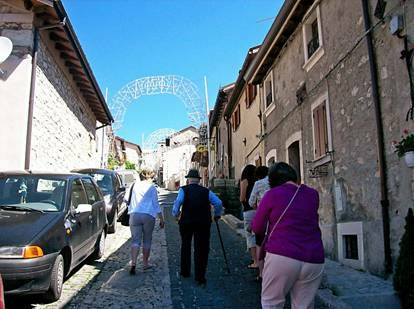 Susan stumbled upon my website in her search for information about the Festival di San Giovanni Baptiste (the patron saint of Opi). Susan was planning a trip to Italy in 2012 to participate in the festival. She would be traveling with her daughter, sister, cousin, sister-in-law, and friend. Susan and I are connected through our Boccia and Gentile ancestors. Below is a blog Susan has written and graciously allowed me to post. Thank you Susan, I hope you are able to enjoy many more summers to come in our home land! 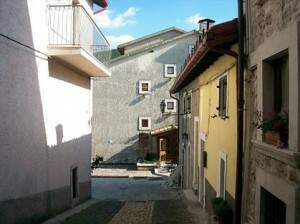 The view from Via Salita La Croce is beautiful, unique and narrow. We stayed at Antica Rua B&B. From our doorway look right and the via ends at a little hotel at the downside of the village. Look left up the via toward the little castle at the village square. But there is more, higher, farther and narrower. Nicolangelo Leone walked down the via to the B&B to welcome us and invite us to his home. Side note: Every step you take in Opi is either up or down, since the village is built on the top of a mountain. Just imagine how healthy one must be to live in Opi. 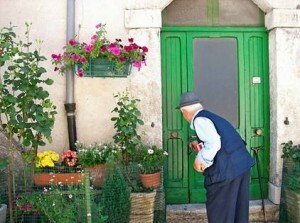 Nicolangelo is 89 and he’s turning 90 on 15 January 2013. In Italian, he told us he went to see a cardiologist for his heart. Oh no, we were instantly worried and concerned until he quickly presented to us his prescribed medicine – the package read for “indigestion.” Ooohh, thank goodness. We walked up, past the bar, past the castle through a narrow walkway, up the stairs, past the Santa Maria Assunta church, turned left onto a smaller via, and arrived at Nicolangelo’s beautiful green door. Welcome! Benvenuti a cinque donne americane. Please come in….Saluti Nicolangelo. You are a very charming man and you stole our hearts from day one! We were invited to meet the Officers of Opi at cappella San Giovanna Battista on Sunday, June 24, 2012, at 4:00 pm to look at documents. 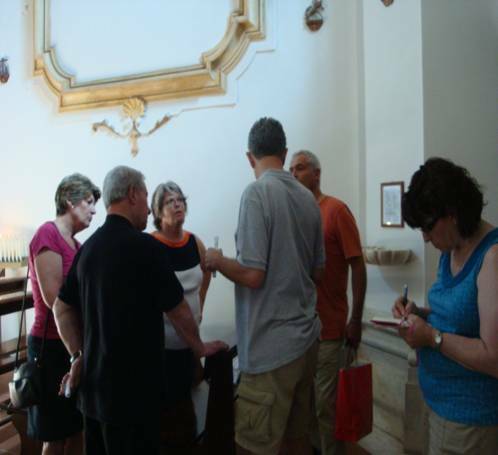 We met so many people in Opi who introduced themselves and asked in Italian: How are you related to us? Who are your closest relatives that live in Opi? In my best Italian, I explained our Opi heritage and how our families in the US stayed connected through San Giovanni Battista Society (SGBS). Also, explained SGBS morto in 2008. Yes they understood, but… the connection. How are you connected to us? When introductions are made, Opianni’s say the last name first. Because of the culture, it was difficult for Opi people to grasp how le cinque donne americane were connected. In Opi, the women keep their maiden names. In the red bag, Maruzio brought the booklet: Societa’ San Giovanni Battista 75th Anniversary Banquet and Dinner Dance, June 26th, 1983 at Roma Hall on Gratiot Avenue in East Detroit, Michigan, a letter from Orazio Paglia, and a list of Members and Sponsors of SGBS. It’s amazing, those documents were 29 years old. Here was the validation! 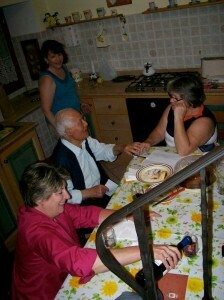 Maruzio pointed to names: Benjamin Boccia, Gene and Susan Reetz. Oh my Godda! Yes, that’s us. We pointed to relatives on the list: Marilynn Wieczorek, Christine’s parents, our parents, aunts, uncles, and cousins. All the same names: Boccia, Gentile, Tatti, Paglia, Cimini, Ursiti, Sabatini, Ricci, DiVito, and more. So exciting! Everyone was talking at once. We were happy and filled with so many more emotions. 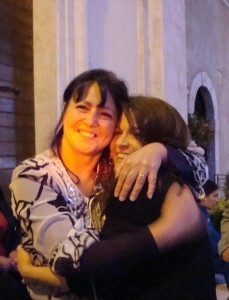 This is Orsola Gentile hugging my daughter, Corinn. Look at how cute they are and there is a resemblance. My grandmother’s name was Grazia Gentile. Corinn and Orsola look like sisters. We were celebrating the SGB feste, listening and dancing to a live band in Opi on June 24. Very fun! Nicolangelo and I are speaking Italian. I learned enough with Beginner I & II language classes at the Italian American Cultural Society to be able to carry on conversations. I kept telling Nicolangelo that I was married “marito” , but he took off his wedding ring and pretended to throw it away. He was very charming. Correction to my post. SGBS was in existance 100 years when the society ended in 2008. It started in Detroit, Michigan in 1908 from Italians who immigrated from Opi, Aguila, Abruzzo, Italy. The families found strength and support from each other through the San Giovanni Battista Society. One of the eldest members died recently, Lucy Boccia. Great to see there are descendants of Opi people trying to determine their connections. My grandfather Americo Sabatini emigrated from Opi at age 9 to NY City circa 1900. I believe his father’s name was John (Giovanni? ).He had a brother John and a Sister ( I do not know her name). I am trying to find her decedents. She came with the family to NY but returned to Opi to marry probably about 1920 and raise a family. She was probably born about 1895 to 1900. We have lost touch through the years and as you can see by the ages, they are long past. If anyone has any knowledge of her or other members of my extended family I would be very grateful to hear your stories. Thank you.